It is fairly easy to make your own stamps. 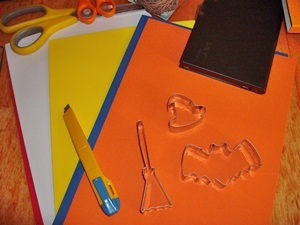 For those who who like to make use of synergies, like we love to do, it is even easier – as you can use cookie cutters for the shapes of your stamps. Why synergies? Because you might have used the very same cookie cutters for other elements of your party decorations. Maybe you already have cookies matching your party theme, or decorations for your party cake, or as ingredient to a soup (have a look at our dragon soup), or for finger food (as we did for our spooky Flapis) or you used them to decorate your invitation cards (look at our Easter card crafts). The making of stamps is a craft for adults and bigger kids, as you have to cut precisely and be able to use a sharp cutter. The stamping is fun for the whole family and highly recommended for smaller kids. 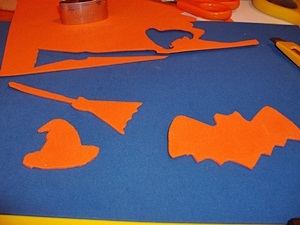 cookie cutters, we used the Walpurgis night cutter set witches' hat and witches' broom as well as the bat Ferdl shape. Strongly press the cookie cutter into the foam rubber sheet. Use the sharp cutter to cut along the lines. 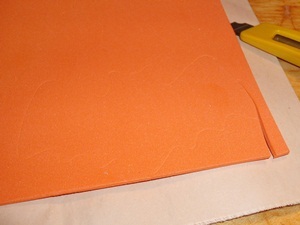 Strongly push cutters onto the rubber foam sheet, then cut the lines with a sharp knife. Put some glue on the backside of the rubber foam shape and attach it to a wooden piece. Now you have got your stamp with holder. You can of course use your foam rubber stamp without grip, but that is a little tricky. Press your stamp into an ink pad and stamp right away. For those how don't have large ink pads you can attach colour to the stamp as well. We used acrylic paint form our box of paints and added some water. 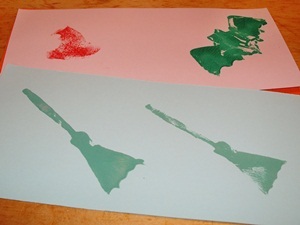 If you attach more colour you can stamp more than once (see picture of the broom). You can add the colour with a brush or put colour into a plate or the lid of a jam jar. And what are we going to decorate with our spooky stamps? We will tell a little later. You can use these stamps for many things like stamping paper towels, or invitation cards and even paper pinwheels. Use quadratic paper, stamp it, you could even paint a spider net on it and a few tiny spiders – there you have matching spooky paper pin wheels (we do call them windmills). Making paper pinwheels is quick and fun, see instructions here: Paper Pinwheel. Well, you see, we are a little obsessed with party decoration. You can as well use the stamps to individually imprint a t-shirt or fabric bags, use fabric paint in your preferred colours. 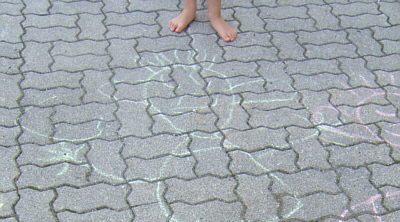 Find more creative and fun projects over at the link collection of Craft Schooling Sunday.